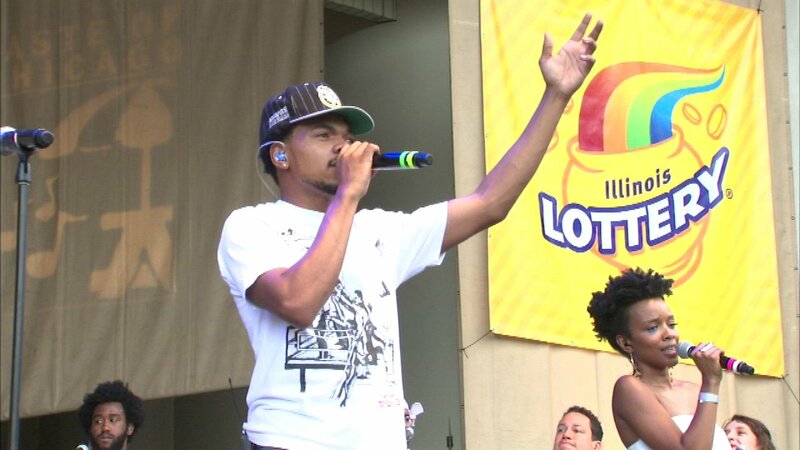 CHICAGO -- Chance the Rapper put a ring on it! The Chatham native proposed to his longtime girlfriend at a 4th of July barbecue on the South Side. Chance and his new fiancee, Kirsten Corley, were surrounded by family and friends when he popped the question. A video posted on social media shows Chance getting down on one knee in a backyard and asking Corley, "Will you make me a man and be my wife?" Last month, Chance, whose birth name is Chancelor Bennett, wrote a touching message to his now-fiance on Instagram in honor of her birthday. "From the beginning beginning to the end end," he wrote. "You are my oldest and best friend. You are responsible for everyone of the most wonderful things in my life. I'm forever grateful that God made me find you, and even more grateful that you made me find God. Forever and ever babe." Corley and Chance, 25, started dating in 2013 but separated in 2016 when Corley attempted to get full custody of their daughter and requested child support. When the agreement was reached in March of 2017, Enrico Mirabelli, Corley's attorney, praised both parents, saying they came to an agreement that "put their child first." "That's the way it should be done," Mirabelli said. "And when you settle between yourselves, you leave nothing to chance." The split didn't last long, with the couple reconciling later that year. ABC News and The Sun-Times Media Wire contributed to this report.